A typical south Indian food, best suits for lunch box can be prepared in two ways. One method is prepared using fresh ripe tomatoes and boiling rice with them. Another method is preparing tomato gravy and rice separately and mixing them together to make a rice. Both the methods are very simple. Here I am posting the first method cooking tomatoes with rice to gether. 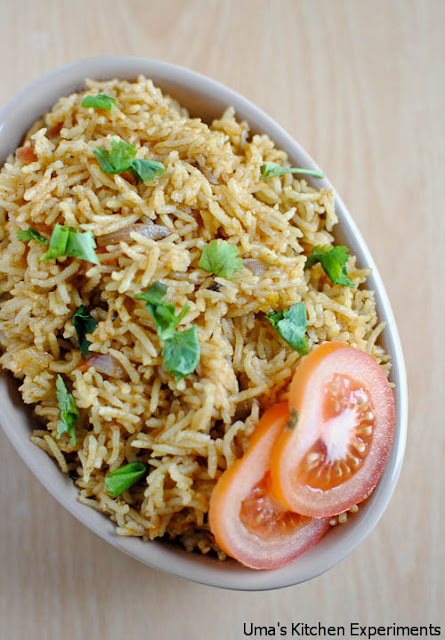 1) Wash rice two or three times thoroughly using water. Keep aside after washing. 2) In a steam cooker, Heat oil and add mustard seeds and fennel seeds. 3) when they crackle, add crushed clove and curry leaves. 4) Add chopped onions and saute till they are translucent. 5) Add minced ginger and garlic. Saute for few seconds. 6) Add chopped tomatoes and saute till they are completely mashed. 7) Add red chilli powder and coriander powder and fry till the raw smeel of masala goes off. 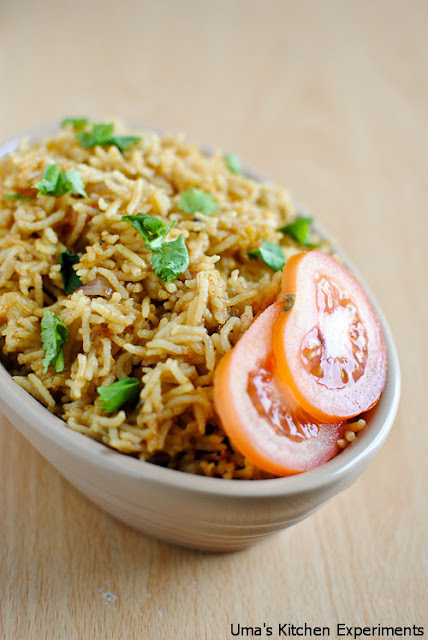 8) Add washed rice and add 2 cups of water. Add salt to taste. 9) Mix well and cover the cooker using the lid. 10) Wait for 3 whistles. When steam releases from cooker, mix the rice gently. Garnish with coriander leaves. 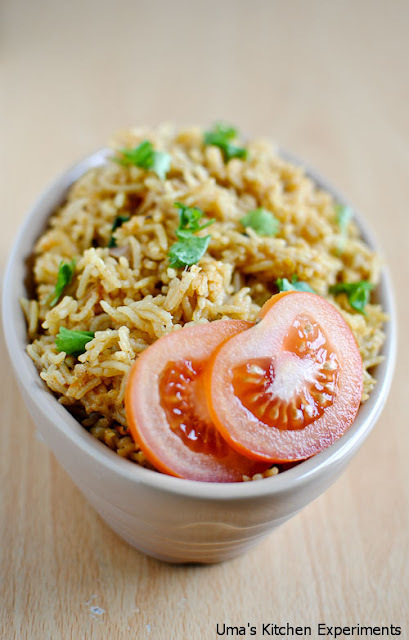 11) Tomato rice is ready and Serve hot with any raitha.